A Lagos-based lawyer, Edward Oseghale, has been arraigned before an Ogba Magistrates’ Court for procuring false court judgement. It was learnt that Oseghale allegedly forged a judgment purportedly given by Mrs Toluwalase Abayomi, the magistrate of Court 4, Surulere Magistrates’ Court. He was alleged to have used the forged judgment to evict a tenant from a house on behalf of his client. Oseghale’s document, The Punch reports, was found to be fake when the tenant’s lawyer came to the Surulere Magistrates’ Court to verify the authenticity of the judgment. Oseghale was thereafter nabbed on the premises of the court while attending to another matter. He was arraigned on 5 counts bordering on conspiracy and forgery. The magistrate, O.A. 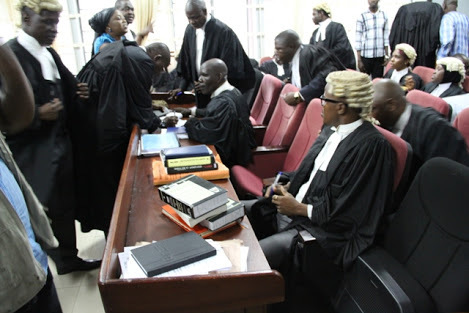 Ojo, admitted Oseghale to bail in the sum of N50,000 with two sureties in like sum. She said one of the sureties must be a property owner in Lagos with valid Certificate of Occupancy. She stated that the other surety must be working in a reputable company in the state, adding that both sureties must show evidence of tax payment. Ojo adjourned the matter till November 8.